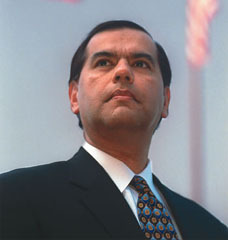 Gaddi Vasquez was nominated by President George Bush and sworn in as the Director of Peace Corps on February 15, 2002. He is the Agency's first Hispanic-American Director. Director Vasquez came to Peace Corps from the Southern California Edison Company where he was Division Vice President of Public Affairs. Previously, he has served in the administrations of former California Governors George Deukmejian, Pete Wilson and Gray Davis. He was twice appointed by former President George H. W. Bush to federal commissions. Mr. Vasquez' 22-year public service career includes service at the city, county, state and federal levels of government. He began his service as a police officer in the City of Orange, California. Mr. Vasquez has a long record of activity in community affairs, he has served on the National Advisory Board of the Salvation Army, the Board of Directors of the National Association of Latino Elected and Appointed Officials, and the National Advisory Board of the National Association of Hispanic Real Estate Professionals. At the local level, he served on the Board of Directors of the Orange County Council for the Boy Scouts of America, the National Conference for Community and Justice (NCCJ), the St. Joseph Hospital Foundation, KOCE-TV Foundation (a PBS affiliate) and is a co-founding chairman of the Orange County Hispanic Education Fund which has raised over $1 million to fund scholarships for Latino students in Orange County. Mr. Vasquez also served on the advisory board of the Pediatric Cancer Research Foundation and on the Board of Directors of Olive Crest, an organization dedicated to the protection and development of children and youth who are neglected, abandoned and abused. A native of Carrizo Springs, Texas, Mr. Vasquez' parents were migrant farm workers of Mexican descent, who instilled in him a strong work ethic and the desire to succeed, despite adverse circumstances. He is the first member of his family to earn a college degree. He is a graduate of the University of Redlands and has served as a trustee professor at Chapman University. Mr. Vasquez has received numerous awards for leadership and community service including the Coro Foundation Crystal Eagle Award and the Marine Corps Scholarship Fund Globe and Anchor Award. He is the recipient of the Orange County Black Chamber of Commerce Award for Community Leadership, the Jewish National Fund Tree of Life Award, the B'nai Brith Award for Leadership and Community Service. He was also recognized by the Mexican American Legal Defense and Education Fund and the U.S. Hispanic Chamber of Commerce. 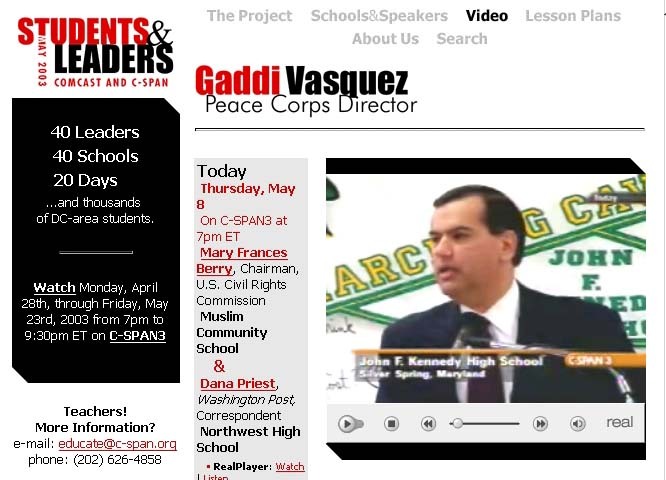 WASHINGTON, D.C., APRIL 29, 2003 - Today, Peace Corps Director Gaddi H. Vasquez visited John F. Kennedy High School in Silver Spring, MD, to speak to students about leadership and public service. The event is part of a C-SPAN and Comcast initiative designed to create a unique, month-long educational experience for District of Columbia, Maryland and Virginia high school students through a program called Students & Leaders. The program will air nationally on C-SPAN3 at 7 pm ET Tuesday, April 29, on Comcast Digital Cable channel 105. The C-SPAN Education Foundation is also offering $25,000 in college scholarship money to D.C., Maryland and Virginia high school seniors as part of the project. More information on the scholarship competition is available through C-SPAN's Educators Hotline at 202-626-4858. Comcast serves more than 3 million customers in Maryland, Delaware, Virginia, the District of Columbia, Southern Florida, and parts of Pennsylvania, Ohio and West Virginia. C-SPAN is a non-profit company, created by the cable industry, funded by its affiliates without government or taxpayer support. The C-SPAN networks provide long-form public affairs programming without editing, commentary, or analysis. Since 1961, more than 168,000 volunteers have served in the Peace Corps, working in such diverse fields as education, health and HIV/AIDS awareness and education, information technology, business development, the environment, and agriculture. Peace Corps volunteers must be U.S. citizens and at least 18 years of age. Peace Corps service is a two-year commitment.